Introducing Woolly's Next Artistic Director! We’re incredibly excited for you to meet Maria Manuela Goyanes, Woolly’s next Artistic Director! 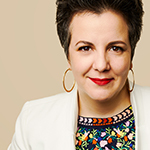 Maria will be joining Woolly in September after 14 years on the staff of The Public Theater in New York, where she’s currently serving as the Director of Producing and Artistic Planning. She oversees the day-to-day execution of a full slate of plays and musicals at the Public’s five-theater venue at Astor Place, as well as the Delacorte Theater for Shakespeare in the Park. In addition, she spearheads the season planning process as well as the planning and integration of The Public’s many artistic programs, including the Under the Radar Festival, Public Works, and special offerings in Joe’s Pub. For six years before she assumed her current position, she worked as an Associate Producer, managing some of The Public’s most celebrated productions, including Hamilton by Lin-Manuel Miranda, Josephine & I by Cush Jumbo, Straight White Men by Young Jean Lee, Barbecue by Woolly company member Robert O’Hara, and Here Lies Love by David Byrne and Fatboy Slim, among others, as well as the Public Works’ productions of The Tempest, The Winter’s Tale, The Odyssey, and Twelfth Night. Maria has a compelling vision for the art Woolly can make, the impact we can have with that art, and the ways in which our work can galvanize communities. As a member of the faculties of both Juilliard and NYU, a board member of the National Alliance for Musical Theatre, the former Executive Producer of the 13P playwrights collective, and the former Co-Chair of the Soho Rep Writer/Director Lab, she’s a deeply experienced innovator who will build on Woolly’s legacy. She embodies the values that have lived at the core of Woolly for nearly 40 years. Maria is joining Woolly after an exhaustive eight-month nationwide search, which we conducted in partnership with Management Consultants for the Arts. We’re incredibly proud of the open, transparent, and inclusive process we relied on. We solicited candid input from throughout the Woolly community, and the extraordinary diversity of our large candidate pool reflected a careful design intended to make sure we truly had the opportunity to find the right new leader for Woolly. 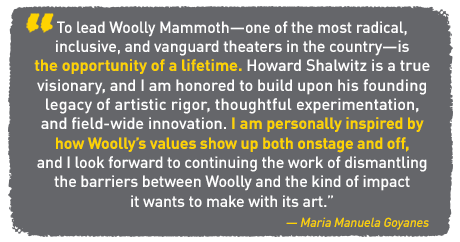 As we imagine Woolly Mammoth unfolding under Maria’s leadership, we are filled with pride. She’s been a champion for adventurous playwrights and an inspiration for great actors, directors, and designers, and she’s poised to play a leadership role in our city and in our field. She’s one of the most highly regarded artistic producers in the field, and she’s had a huge influence on so many artists making work today. Most importantly, her values are deeply aligned with Woolly’s. We hope you’re as excited as we are. We look forward to seeing you again soon at Woolly!